Last night, I was a refugee. A first world refugee, but one nonetheless. This is not to make light of countless refugees who have had to flee their homelands, but the fact remains I was briefly a refugee quarantined at Quebec City's finest gay bar with no place to call home. The night started with great intentions: host a surprise party at the local gay bar for a show hen who is leaving us this week. The surprise was a success and the night was off to a great start with drinks and cake under our belts all before 8 p.m. At this rate, we could have both a rowdy night out and a full night's sleep. The night took a turn a few hours into the night, and it wasn't just the drag queens showing up or the old woman trying to steal our shots. A few show hens arrived to tell us that there was a fire in our hotel and it was being evacuated. That's not the kind of news anyone wants on their fourth martini. With that, the rumor mill and speculation quickly began to spin amongst our large group. On what floor was the fire? The whole hotel was in flames? The hotel was flooded? Who left their hair straightener plugged in? Would my leftovers spoil? Would the company pay for my drinks? Should I sober up or drink more? Just as we were in full flurry with questions, the drag show started. 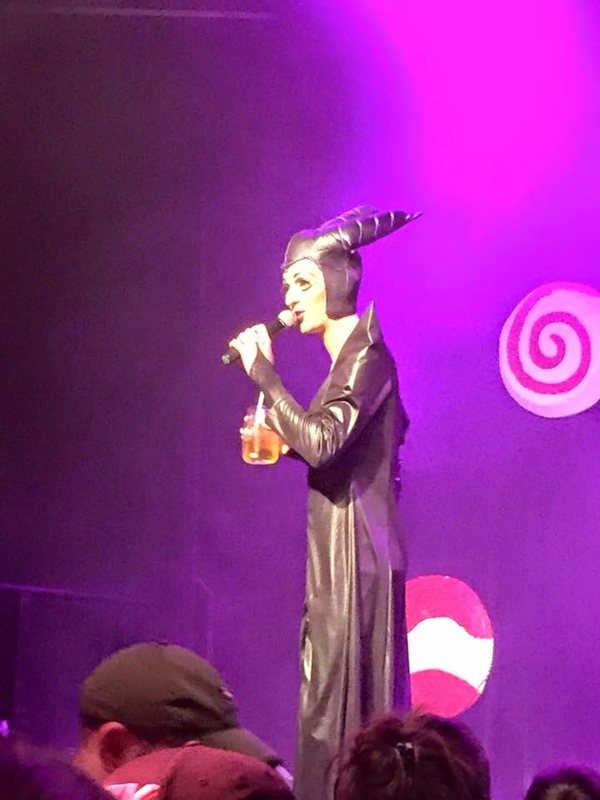 Nothing like a French Canadian man dressed as Maleficent welcoming Hens on Ice to the bar while our lives were up in flames just up the road. Thankfully for the show staff, 90% of our large group was already in the bar, so there were only a few stray birds to corral, and the most logical place to keep everyone was the gay bar. While we waited for more information and what the plan would be for sleeping that night, we were told not to leave the bar. Temporarily homeless refugee hens stuck at the French Canadian gay bar - the glamour of life in a traveling show. Tequila, por favor. As we waited, the drag show digressed from pretty good, to weird, to jaw-dropping and keep the martinis coming. Not only was the queen in the cheetah print skin suit at least 300 pounds, her act continued to go down hill after another queen poured her a bowl of milk. Never pour a drag queen a bowl of milk for her act. Visually-scarred and martini-drunk, a bus arrived for us and we would be able to get a night's-worth of belongings for spending the night at a different hotel. The bus was an emptied public city bus. To keep morale up or to get his karaoke fix, one hen rallied most of the troops to a sing-along to which I knew none of the words. Most hens sang and shouted along, some stewed silently, a few cried, and one kept squaking, "TONIGHT'S THE NIGHT I SNAP!" I'm not confessing which hen I was. We returned to our smoldering hotel, greeted with a faint whiff of smoke and frozen escalators, but fully-functioning elevators. We arrived to the dark sixth floor, using phone flashlights to navigate to our rooms, where the lamps were left on as I'd left them. (I swear I'm normally going green.) We had 10 minutes to gather what we'd need for a night in another hotel. Hurried, I tried to decide what was essential. Aside from clothes for the next day and toiletries (minus the face wash I forgot), did I need anything else? Computer? One Direction blanket? Wine? Yes, all of those things, plus my sack of laundry. I'd planned to do laundry the next day, and no fire was going to change that. We flooded the lobby of our new hotel, drunk, confused, and clutching what random possessions we deemed important after 6 martinis. Stuffed animals, blankets, half bottles of wine, and underwear seemed to be the most popular items. Pair by pair, we received our room keys. Although the singing had stopped, we still filled the lobby with clamor, and I was still yelling, "TONIGHT'S THE NIGHT I SNAP!" But from the gay bar and the city bus, we all were safe and had a roof over our heads for the night. Although the night didn't go as any night should be planned, when I set my alarm for the next day, it was about the time I'd wanted to be going to bed when the night started. But, where was I? Keep reading! "I'm a Horrible Hen!" "I Just Want a Sidewalk!"